Legendary netminder Patrick Roy might be available after resigning as Colorado’s Vice President and Head Coach. Roy’s departure was a complete shock to the organization and in many ways left the Avs speechless. Roy cited an internal problem between him and the Colorado hockey operations department, suggesting his voice wasn’t being heard. While the news of this hit, some people weren’t surprised by Roy’s decision. He’s a successful hothead that works best when emotional and passionate. He played that way, and from the first time he graced the step behind the bench, he coached that way. Although let’s be serious, Roy the coach is not the Roy the goalie. Moments after the news broke, rumors started to pour in. Did Roy resign for another job? Will Roy end up in Montreal? Will Roy be Las Vegas’s first coach? First off, does anyone believe Roy resigned because he’s heading to Las Vegas? Ten months before he even has a player to coach? I know I sure don’t. Secondly, is Roy even the type of coach The Creator wants to hire? I don’t believe that either. Allow me to prove it to you. Here are a few reasons why Roy won’t be the first head coach in Las Vegas. After a blowout 6-1 victory over Anaheim to claim his first win as coach, Roy got himself fined $10,000 for losing his cool. The game was very chippy, and got out of hand when rookie Nate McKinnon took a hit by Ben Lovejoy. Colorado’s players got very upset, but not as upset as their coach. Roy started yelling at Anaheim players, then physically attacked the glass partition that separates both team benches. Bruce Boudreau had the best line of the night. After losing a coach’s challenge and going down 3-1 to the Jets, Roy completely lost his mind. He got in the face of the game refs, who were trying to explain why Roy lost his challenge. This happens in every NHL game around the league, but Roy didn’t like the referees explanation. He lit in to the linesman and earned his team a 2-minute penalty kill. Not many coaches get minor penalties. I know it happened to Coach Q last year, but Q has three Cups. For a third year coach, it wasn’t the way a leader should act. Towards the end of a blowout loss to the St Louis Blues, sniper Matt Duchene tipped in his 30th goal and began to celebrate. Sure, a little unnecessary to celebrate but Duchene was excited to reach to the 30 goal milestone. If Roy took his star forward aside and gave him an earful that’s one thing, but the Avs coach handled it completely different. Instead, he used his postgame press conference to attack Duchene. As exciting and emotional as Patrick Roy is, his act doesn’t fit a new organization like Las Vegas. The team wants to succeed but build along the way. If the team goes on a tough stretch, will Roy be pleasant to be around? Will his players want to hear all the yelling? He’s just too volatile to bring in as the organizations first coach. Roy’s leadership needs improvement, his temper needs chill, and he needs to respect today’s players. Let him work on that elsewhere first. 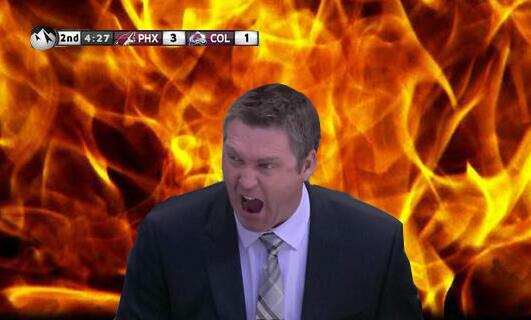 Although, I wouldn’t mind seeing Roy scream at some of the media in town after a tough loss. I think Claude Julien is at the top of the wishlist. Vast experience has been a recurring theme in the hiring process so far. Initially I thought Las Vegas would hire an up and comer like Travis Green of the AHL’s Utica Comets to cultivate a young team. I like Claude too, and really gets no love from the Bruins. I’m convinced he will be the next coach of the Canadiens. They only hire French speaking coachs. Pretty limited. I’m still enamoured with Jack Capuano. Not too young, not too old and enough experience in a major market. He’s another guy that gets now respect from his organization. Plus I think he does a lot with alittle. In all honesty, despite his talent, I have never like Roy. I would have a very hard time supporting a team he was a part of. RB he did act like an a$$wipe everywhere he went. And remember that story when he was coaching in juniors and told his kid to go after another player who clearly didn’t want to fight. Roy and his son looked like real schmucks. So I completely get your dislike. Murray Craven said two of his best friends are Detroit Red Wings assistant coach Doug Houda and Pittsburgh Penguins assistant coach Rick Tocchet. It appears that Craven’s fingerprints are all over the franchise. I wouldn’t be surprised if Houda and Tocchet interview for the job. The Penguins are the flavour of the month at the moment. Not sure how much Mike Sullivan has rubbed off on Tocchet. I agree Roy doesn’t “fit” unless a hot head is what you want. James, I know this may be ancient history but do you think the Tocchet wagering scandal may kill his chances in Vegas? Leopard doesn’t change his spots. I know when I moved here, there was no way I wasn’t betting on sports. Either way, I like your info and suggestions. Just wondering if Tocchet’s past may hurt his chances. That’s a good point. I should have done some more digging. The fact that the NHL won’t even consider ‘Aces’ in any form as a team name shows how image conscious the league is when it comes to gambling. Tocchet’s wagering scandal certainly won’t help his chances in this market. The national media/social media would have a field day. Sounds like Roy and McPhee are a perfect fit, two peas in a pod.